UK, Congleton Cycle Network Map - Printable on A4 Paper. Note that this is archived info. Our 2013 map is more up to date. 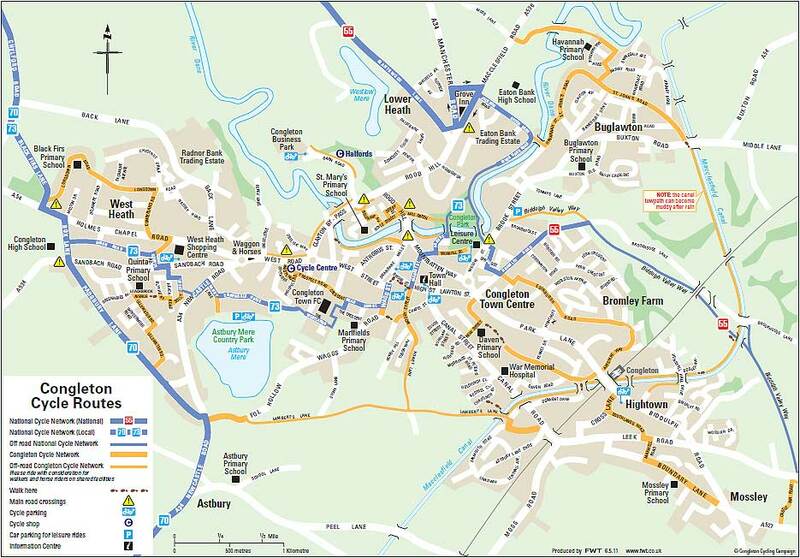 The 3rd edition (2011) map was distributed to all year 5 and 6 schoolchildren in the town, in addition to being available at Congleton cycle shops, library and tourist info. centre. The latest map (2013) is much bigger and covers the towns of SE Cheshire and countryside between; it can be picked up, free, from railway stations, libraries, leisure centres and tourist info. centres. It’s too big for easy viewing on a website, but the Congleton section doesn’t differ markedly from our 2011 map. Click on the image to see the full size, which will print out on an A4 sheet.